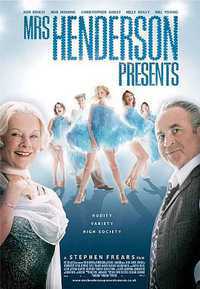 Mrs Henderson Presents is a 2005 British biographical film written by American playwright Martin Sherman and directed by Stephen Frears. It stars Judi Dench, Bob Hoskins, Kelly Reilly, and Pop Idol winner Will Young in his acting debut. The film tells the true story of Laura Henderson, an eccentric British socialite who invested her money to create the Windmill Theatre in London during World War II. This webpage uses material from the Wikipedia article "Mrs_Henderson_Presents" and is licensed under the GNU Free Documentation License. Reality TV World is not responsible for any errors or omissions the Wikipedia article may contain.